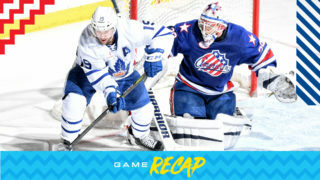 Chris Mueller scored the winner as the Marlies and Monsters went to overtime for a third straight game Wednesday night, and just like the two previous meetings, the road team came up victorious. 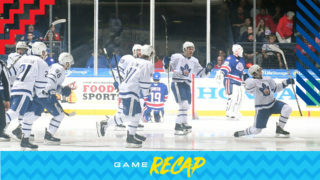 The victory was the 158th behind the bench for Sheldon Keefe, setting a new Marlies franchise record for career wins. The scoring started fast and frantically with three goals in the first five minutes. Dmytro Timashov opened the scoring, followed by a quick response from Cleveland’s Kevin Stenlund before Rasmus Sandin scored on the power play to put the Marlies back ahead. The 2-1 score held up heading into the second Cleveland fought back to take the lead off goals by Eric Robinson and Justin Scott. Adam Brooks tied things up less than two minutes into the third but again the Monsters responded with Zac Dalpe scoring midway through the final frame. Less than a minute later, Trevor Moore connected on his tenth of the season to tie things up and eventually send the game to overtime. 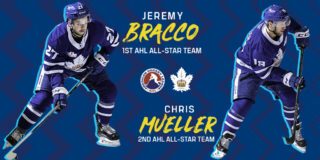 In the extra frame, with a delayed penalty coming to Cleveland, Jeremy Bracco found Mueller at the top of the crease and he made no mistake backhanding it into the back of the net to give the Marlies the win. Eamon McAdam earned the win for Toronto with 28 saves while Matiss Kivlenieks also had 28 stops for Cleveland. The Marlies converted on two of four power play chances and killed off all four shorthanded situations. Dmytro Timashov scored unassisted 34 seconds into the first period and later added the primary assist on Moore’s power play goal in the third period. This was the fastest goal scored by Toronto this season. Timashov has 13 points (5 goals, 8 assists) in 19 games this season. Rasmus Sandin scored on the power play at 4:45 of the first period. This is Sandin’s second power play goal. He has six points (4 goals, 2 assists) in 10 games this season. Sandin is tied for the AHL-lead in goals with rookie defencemen. Adam Brooks scored at 1:36 of the third period. Brooks has seven points (2 goals, 5 assists) in seven games. Trevor Moore scored the tying goal on the power play at 13:36 of the third period and earlier added the secondary assist on Brooks’ third period goal. 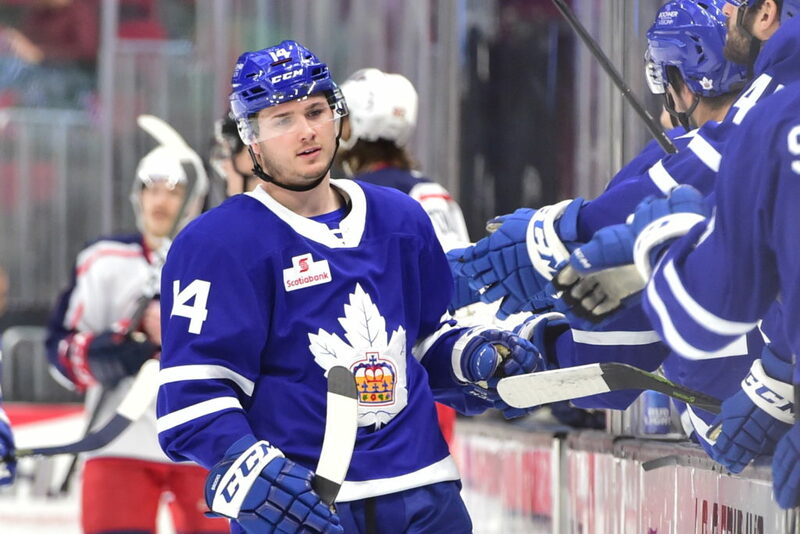 Moore has 15 points (10 goals, 5 assists) in 16 games, leading the Marlies in goals. Chris Mueller scored at 2:36 of overtime. This is Mueller’s third game-winner of the season. Mueller has 17 points (9 goals, 8 assists) in 17 games this season. Giorgio Estephan recorded the primary assist on Sandin’s first period power play goal. This is Estephan’s first point as a Marlie. Carl Grundstrom registered the secondary assist on Sandin’s first period power play goal. Grundstrom has 16 points (7 goals, 9 assists) through 17 games this season. Andreas Borgman had the primary assist on Brooks’ third period goal. Jeremy Bracco recorded the secondary assist on Moore’s third period power play goal and the primary assist on Mueller’s overtime goal. Bracco has 11 points (1 goal, 10 assists) through 9 games this season. Calle Rosen had the secondary assist on Mueller’s overtime goal. Rosen leads the Marlies in assists (15) and is tied for the League-lead amongst defencemen. Eamon McAdam stopped 28 of 32 shots he faced. McAdam is now 4-0-2-1 on the season with a .893 Save Percentage and a 3.09 Goals Against Average. The Toronto Marlies record under Sheldon Keefe is now 158-70-13-6 through 247 games for a winning percentage of 0.672. 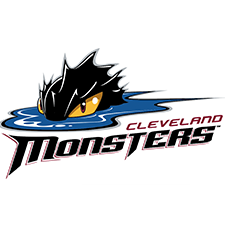 Keefe tied Dallas Eakins’ record of 157 wins on November 23 with a 6-5 overtime win against the Cleveland Monsters. Keefe was named head coach of the Marlies on June 8, 2015. The Marlies captured the franchise’s first Calder Cup (2018) and have secured the Macgregor Kilpatrick Trophy twice (2015-16, 2017-18) in Keefe’s three seasons as head coach. Toronto went 4-for-4 on the penalty kill and 2-for-4 on the power play. Toronto had a 33-32 edge in shots in all situations. 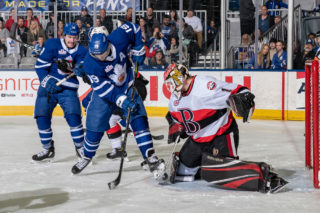 The Marlies are 7-7-2-2 against North Division opponents and are 2-1-1-1 against the Cleveland Monsters this season. The Marlies have been outscored by the Monsters 23-21 with three games remaining this season. It’s a lot like the way that our season has gone, isn’t it? I didn’t like our start, our first period was no good. Strangely, we come out with a lead. Then we played a pretty good second period and gave up the lead. Funny how it works and then I thought our guys pushed again in the third period, responded well at different times. Obviously when they scored, we had to find our way back. Power play got going today, that was a really good thing for us. We had a huge penalty kill at the end of the game there, gave us a chance to get one point, gave us a chance to play for the second. Definitely a lot of things going on in the game but liked how our guys stuck with it and found a way and got better. I think our structure (on the penalty kill) has gotten a bit better. We’ve got a lot of new faces that are on the penalty kill this year from last year. They’re a lot more comfortable with what our expectations are of them. Goaltending has settled down a little bit for us. All those types of things have contributed to the penalty kill. And confidence, when you have confidence, you can get out there at a time like that with the game on the line and just get the job done. Credit for the guys, credit to Rob Davison and the work that he’s done there. And then same with the power play. Special teams have been a bit of a liability here for us. Today, they ended up being the difference and getting us to the one point and then the second. I was made aware of it, reminded of it here in the last little bit. To get the win, it means that we had to get the win first of all. It is an opportunity to talk about the number of great people that I’ve been very fortunate to work with here, a number of great players that put us in this situation and have good teams, competitive teams. To win more than we lose is a good thing but it’s an opportunity for me to speak about how great the people are here and just how grateful I am for the effort that they give every day. 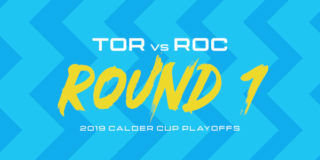 The Toronto Marlies (7-7-2-2) and Cleveland Monsters (10-7-2-0) will face off for a third straight game Wednesday night as the season series heats up with each of the past three meetings going to overtime. 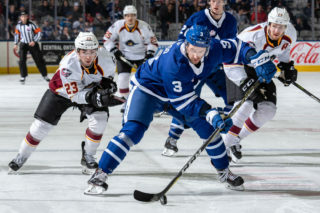 The Marlies won on the road last Friday, downing the Monsters 6-5 in the extra frame before a late rally from Cleveland gave them a 2-1 overtime win on Sunday. Toronto is 1-1-1-1 on the season so far against Cleveland, and are 3-3-1-2 on the road this year. Chris Mueller leads the Marlies in scoring on the season with eight goals and 16 points while Calle Rosen is tied for a share of the points lead with two goals and 14 assists. Rookie Carl Grundstrom has 15 points on the season (7G, 8A), six of which have come against Cleveland. Mason Marchment will look to continue riding his hot streak with five goals in the past three games. Zac Dalpe leads the Monsters at the other end with eight points (5G, 3A) against Toronto and a team-high 21 points (12G, 9A) on the year. Puck drop for tonight’s game is scheduled for 7:00 and fans can catch all the action on AHLTV. Follow us on Twitter and Instagram for updates and behind-the-scenes access from Quicken Loans Arena.